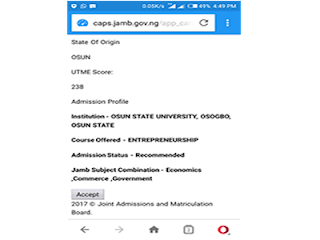 We are informing all prospective Uniosun 2018/2019 Post-utme candidates that the 1st batch list of admitted student have been uploaded on JAMB Caps Portal. UNIOSUN 1st Batch Merit Admission List On JAMB Caps Portal for candidates that participated in the University admission screening exercise. Candidates are required to accept their admission on the portal pending the time the admission list will be uploaded on the University website. 3. If you are admitted, you will see something like the screen shot above. Congratulation to all admitted candidates!! !